This electric sliding rack can be moved with the press of a button. 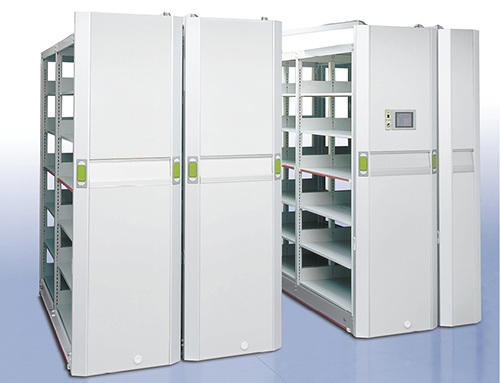 Motor driven, even multiple racks can be smoothly moved at a time, enabling large volume, high density storage. Color touch panels make it easy to operate special features or correct mistakes. 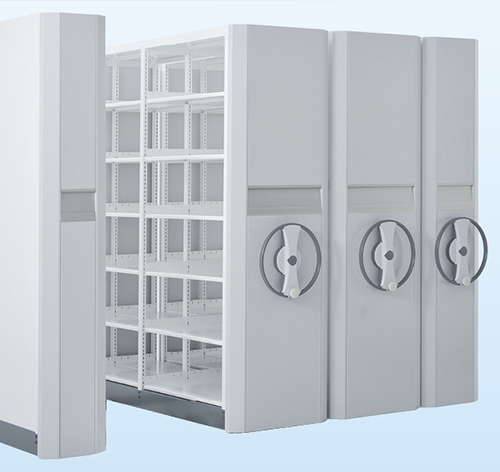 When equipped with IC card security support, the rack can be used to build or expand a diversity of systems for storing patient charts, managing inventory, etc. Uses: hospitals, offices, banks, etc. This electric sliding rack can be accessed in corridors as there are not any level differences caused by rails or slopes. Additions and layout changes are easier than with sliding rack systems that run on rails. The rack uses urethane wheels that do not damage floors. Uses: Offices that frequently changes floor plans, etc. This electric sliding rack can be easily and safely operated by pulling out and inserting pins. 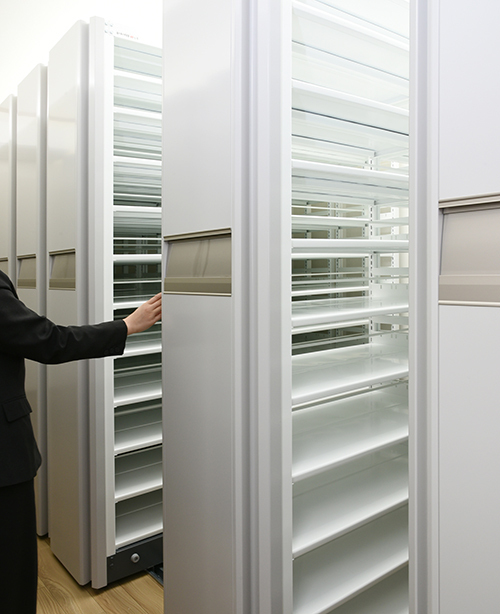 A simple control system enables efficient storage at a price comparable to handle-driven sliding racks. Operating pins, lamps and cables are available in wide color variations that can be selected to match office interiors. Antiseismic options such as fall prevention devices and seismic isolators are available. This handle-driven sliding rack is moved by turning the handle. Owing to a self-propelled 2-wheel drive system, wheels turn smoothly without skidding under lopsided weights or when multiple racks are moved. The rack can move up to a max. 2 tons. The rack is equipped with a seismic isolator that automatically releases the lock if swaying from earthquakes is detected. 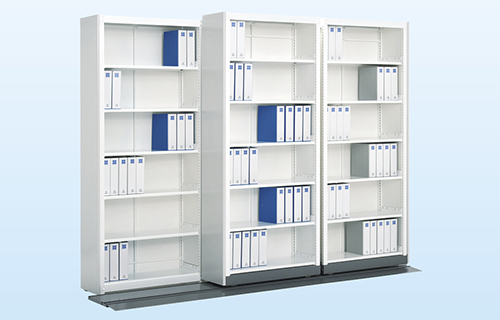 Racks can be easily added and layouts freely changed. 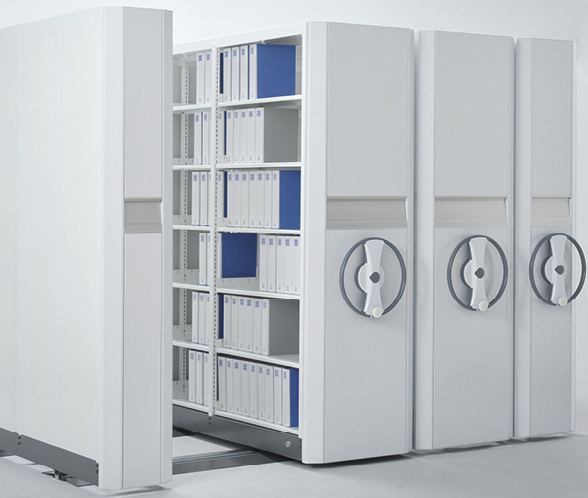 Uses: Warehouses, offices, shelves for libraries, stockrooms or archives for stores and banks, etc. This manual sliding rack is easily moved by pushing and pulling the frame. It instantly increases the storage efficiency of books and documents in cramped offices, etc. The entire rack frame functions as a handle so it can be held at any height to move. The frame has an antibacterial coating, so it stays clean for a long period of time. Also, a fall prevention device at the bottom of the rack comes standard, while other fall prevention options are available. Uses: Offices, school libraries, store stockrooms, personal homes, etc. This sideward sliding rack installs a sideward sliding rack in front of a stationary rack. 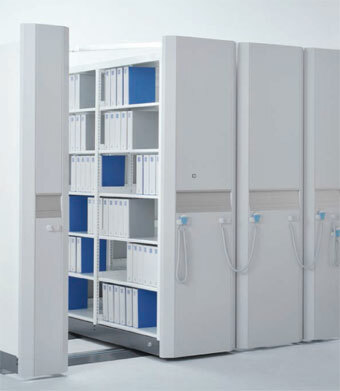 By effectively using wall space, storage capacity can be increased 1.7 to 1.8x compared to singular stationary racks. 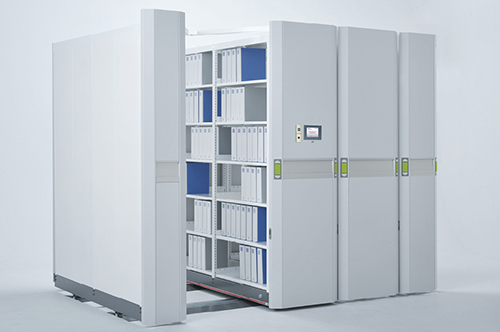 Racks can be added as needed after initial installation. Fall prevention devices that keep the rack from toppling over in the event of an earthquake are available as options. Uses: Offices, personal homes, storage for clothing stores and hotels, etc. COPYRIGHT (C) SANSHIN METAL WORKING CO., LTD. ALL RIGHTS RESERVED.